Bowl with tab handle to top rim, with cream glaze to exterior and light coloured contrasting colour to interior. Gloss glaze to entire body. Floral underglazed painted motif to top surface of handle. Unglazed footring. Good for age with some chipping to edge of handle. 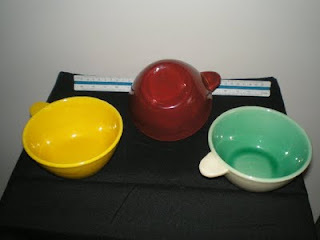 Tab handle and plain wide mouth bowl with harlequin colours to some. Sides slightly curved to narrow base. Some crazing consistent with age and glaze pulling away from base near the spur marks. Karel Jungvirt, was born in Prague, Czechoslovakia 15th August 1927 and was a sculptor and artist who had escaped the 1948 Communist takeover in Czechoslovakia, arrived in Australia in late 1951. His pottery career in Australia began in 1952 when he was initially employed as a mould maker with Diana Pottery in Marrickville. He was soon designing and making models there and it was during his stint with Diana that he met Toni Coles, an East Sydney Technical College graduate who had previously been working in commercial advertising, illustrating catalogues. Coles had started as a ceramic decorator at Diana pottery for what she thought would just be a temporary diversion. But she enjoyed the work so much that she decided to stay on. 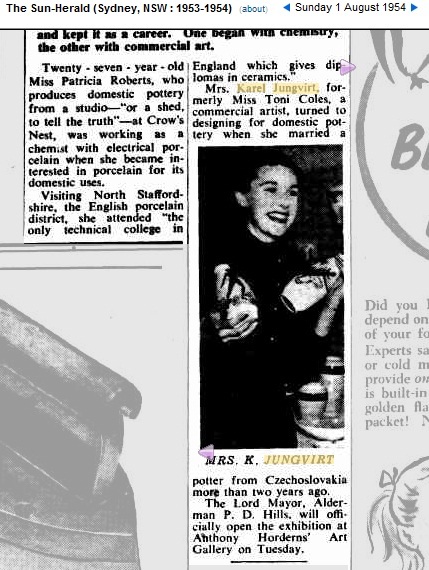 Jungvirt and Coles were married in 1953 and their partnership also became a business one when Karel set up a small pottery in the basement of their flat in Neutral Bay. Arriving in Australia as an accomplished artist, he had began to design and produce slipcast earthenware in a contemporary style which included popular symbols or scenes of Australia, as well as the appropriation of traditional Aboriginal motifs. His major innovation of the time was to introduce underglaze colours and stains that could be painted transparently like watercolours. When it came to registering their pottery as a business, local council restrictions meant that they had to find premises in an industrial zone in order to operate. So in April 1954 they moved to Shepherd Street, Marrickville. This was to be the home of Studio Anna until its closure in 1999. During its period of operation the business would expand to include the two adjoining properties. He originally wanted to call his pottery "Anna Studio" but the registration people got it wrong. From around 1954, orders came to Studio Anna as a result of its displays within the Ceramic Art and Fine Ware Association exhibitions. These were held at Anthony Horderns' Fine Art Gallery in Anthony Horderns' Department Store in Sydney, New South Wales. 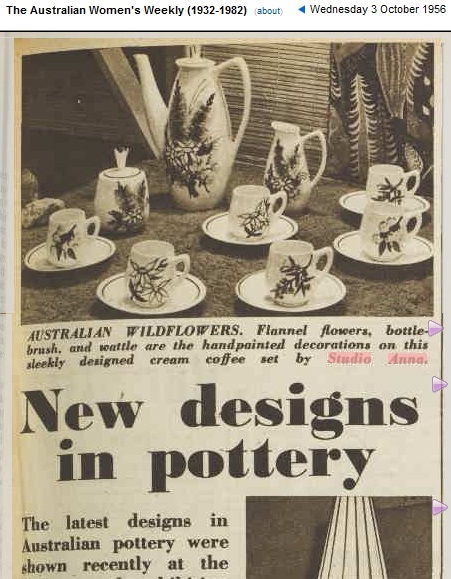 A major exhibition of Australian ceramics by a number of potteries at Proud's store in Sydney that coincided with the 1956 Melbourne Olympics, also generated healthy sales for Studio Anna. Following World War 2, Sydney had become a popular holiday destination, particularly for American and European tourists. Karel capitalised on the resulting demand for souvenirs with an Australian theme by creating slipcast decorated earthenware ceramics designed specifically for this market. Ceramics decorated with local scenes and Aboriginal themes were particularly sought after by both tourists and locals, so adaptations of Aboriginal cave and bark paintings as well as images of Aboriginal people became popular (for Studio Anna and a number of other commercial potteries) throughout the 1950s and 60s. Souvenir shops as such did not exist in Sydney in the 1950s, so Karel approached Swain's Newsagency as a potential stockist for Studio Anna ware. This was a smart move because their extended trading hours allowed to a small number of businesses, (including newsagencies at this time) meant that Studio Anna ceramics would be available to the tourist market when department stores and gift shops were closed. Studio Anna was employing a number of skilled artists at this time as decorators. Several of these artists would also make personal appearances in department stores, demonstrating their decorating skills and generating further interest in Studio Anna ceramics. Toni Jungvirt in particular travelled as far afield as Tasmania and Queensland making well publicised in-store appearances, often over the period of a week. There appear to be no press advertisements for Studio Anna, so these appearances must have been very successful. At its peak, Studio Anna employed over 30 staff and by 1957 their ceramic ware was not only distributed widely in Australia, but was also being exported to such places as Tahiti, New Zealand, Fiji, the United Kingdom, Canada and the United States. 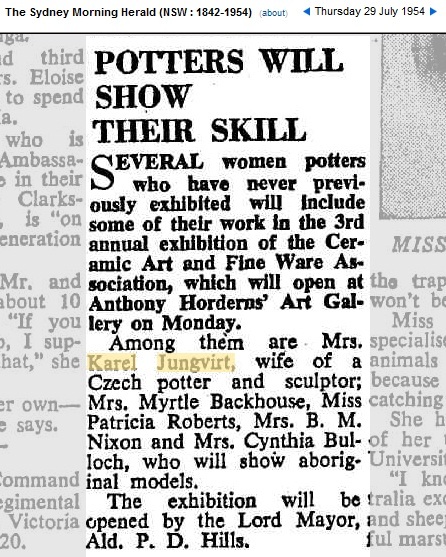 But 1957 also saw a major blow dealt to Studio Anna and other commercial potteries in Australia in the form of the Australia-Japan Agreement on Commerce negotiated by Australian Trade Minister in the Menzies government, John 'Black Jack' McEwan. This agreement opened the doors for a mass of cheap, but good quality Japanese ceramics to enter the Australian market. Although many local commercial potteries producing hand-decorated ware, were forced out of business by this competition, Studio Anna's decorating department, with a reduced staff, managed to survive. In the late 1960s, with public demand for Studio Anna's range of souvenirs increasing, Karel Jungvirt took the step of opening his own souvenir shop, which he named Australiana, in Sydney's newly-built Australia Square. Such was the popularity of this store, which in addition to ceramics also carried craftwork made by an Aboriginal mission station and tea towels designed by Studio Anna artists (along with toy koalas and kangaroos), that eventually a total of five Australiana stores were operating in the Sydney area, including one in the MLC centre. With hand decorated ceramics becoming less and less cost effective for Studio Anna, Jungvirt's next innovation was Fiana ware. Appearing in about the mid 1970s, Fiana ware was a range of glazed kitchen storage canisters with matching salt and pepper shakers, cruet sets, jugs and sugar bowls available in such contemporary colours as antique orange, citrus yellow, olive gold and orange red. Instead of hand painted decoration though, decals (transfers) were now used. You can still find them in Op Shops today. Studio Anna's decorating department still continued to operate, only closing in 1982 when Toni Coles left the business. By the 1980s business had fallen off with only lampbases, kitchenware and hotelware were being produced. By the 1990s Studio Anna was working with a small staff, making mainly lamp-bases for hotels, and working on commission only. In 1999 after many years of illness, during which time he still managed to run the business,the lamp base business and the factory at Marrickville were sold. In 1999 Karel returned to Czechoslovakia, and was given a farewell reception by the Marrickville Council in May. 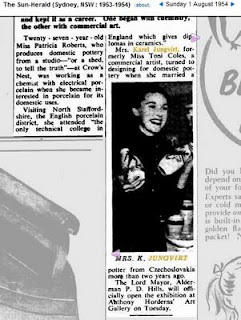 Dorothy Johnston is writing a history of NSW commercial potteries and has interviewed Jungvirt extensively. (Note: published articles vary in the spelling of his name, and in the dates when the pottery started. Most of the records date from the 1950s and 1960s, but the pottery operated from 1992 in Neutral Bay and from 1954 at Shepherd St, Marrickville. Karel died in Dubne Czechoslovakia the following year. Studio Anna was representative of a large number of small commercial potteries making domestic, ornamental and souvenir wares, others being Pate's Potteries, Martin Boyd Pottery, Modern Ceramic Products and Diana Pottery. At the height of its success in the late 1950s, Studio Anna employed many decorators and pottery workers and had an enormous output. The staff was as large as 35 at one stage. They also made souvenirs for the 1956 Olympic Games in Melbourne. Karel was a good promoter of his wares, and operated a number of 'Australiana' shops in Sydney. Decorators included his first wife Toni. He was also a member of the Ceramic Art and Fineware Association. This organisation of commercial potteries contributed to a number of exhibitions in Cannes in the 1950s, the Cannes International Exhibitions of Modern Ceramics, with a number of works selected by judges including Mr Penfold, the director of the Museum of Applied Arts and Sciences. 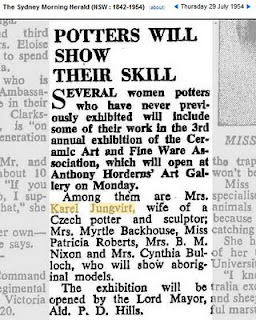 This history was copied from the Powerhouse Museum website and was compiled by them with reference to information contained in the Studio Anna archives and The People's Potteries: Stories of the art potteries of Sydney - post World War II by Dorothy Johnston, Sydney, 2002. The archive from the Studio Anna pottery (1952-1999), and selected collection of ceramics, are from perhaps the longest operating of the dozens of small commercial potteries set up in Sydney in the 1950s. They form an important record of this period and phenomenon. I agree. It's hard to find this type of information even with the resources of the internet on hand.